January 2014 – Jacobs and Company B.I.T.S. Most of us, myself included, have become very comfortable with the way we access files on our computers. We open a folder in Windows Explorer, choose a file, and it opens in the correct application. Most mobile devices like the iPad and iPhone don’t have an easy way to browse for files, much less connect to a server in your office to allow you access to your really important documents. Apps are our saving grace though. There are a number of apps that make it easy to browse that shared folder on your file server. One such app I have started using lately is called FileExplorer by Steven Zhang. There is an app for both iPhone and iPad and both a free and pay version of each. So far I have only used the free version of the app. It lets me browse and access shared folders and open documents that are saved on my file server using my iPhone which, let’s face it, is pretty much the extent of what you would want to do with a file on that tiny little screen. FileExplorer supports opening a number of popular file types inside the app, like Word, Excel, PowerPoint, and PDF to name a few. It allows you to access files on your office server over the local network and also allows you to connect to cloud services like DropBox and GoogleDocs. It is easy to connect to a new file location. You can put in the name of the server you want to connect to or let FileExplorer detect the computers on the network and select the one you want. You will need to provide your Windows username and password in order for FileExplorer to connect to your office server, but once you have done that you have access to all the files and folders you would from your desktop. Want to make this app even more productive? Set up your iPhone or iPad with a VPN connection back to the office and you can access your files while you are away! FileExplorer does have one major shortcoming. It doesn’t allow you to edit any of the documents. You can open a document in another app for editing from the menu inside FileExplorer. The free version of the app does not allow you to upload files back to the server share. If you are looking only to be able to read and view files, then this is the perfect tool for you. For $2.99 you gain the ability to upload files back to the file server as well as the ability to connect to multiple server and cloud services. Mobile devices really allow us to do more and in more places, but it can be hard to learn how to do things in a new way. As we make the transition to the cloud where these devices really shine, apps like FileExplorer help us to bridge the gap. I highly recommend you try an app like FileExplorer for accessing your network files. The tools are there, and although it may take some creative thinking, our mobile devices are the office of the future. Being a father of 3 boys, I watch a lot of cartoons. As a result, I have become a fan of Shrek over the years. He says, “Ogres are like onions. Ogres have layers, and onions have layers.” Well, security on a network is much the same way. Security is made up of layers, and sometimes even the layers have layers! I want to break down some of these layers so that you can understand how your network should be secured. Let’s start at the outside layer — your router. This is one of those layers that has layers of its own. First off, a router is not sufficient to protect your network today. At a minimum, the device that connects you to the internet should include a feature called a stateful inspection firewall. If it does then you are on the right track. Today’s firewalls include an array of security features that previously required several devices to be installed in line with your firewall. In addition to the stateful inspection of data going through it, a firewall should include a way to write security rules like a gate keeper. These rules might for example say no information from facebook.com servers is allowed in to the network. Or only VPN connections from Jim’s home IP address are allowed to connect. If the data going through the firewall gets past the rules, it is subject to a virtual TSA style search. The data is checked for viruses using gateway antivirus software, then it is compared to a list of attach methods to see if the data is conspiring to be up to no good using a technology called intrusion detection. Then if everything checks out, you’re crazy cat video is allowed through the firewall destined for your computer. So we move on to your computer, which is not really a layer of security but should be wrapped in at least a few layers of security, even when it is hiding behind your firewall. Like the firewall, your computer should have at a very minimum an antivirus application installed on it. In addition to antivirus, your computer should have a firewall of its own. Microsoft built a firewall into its operating system about the second or third service pack of Windows XP. This built in firewall is ok, but you can also replace it with more powerful firewalls. Many antivirus vendors include their own firewalls to replace the Microsoft firewall when you install their software. In any event, the firewall on your computer can be configured like the one that connects the network to the internet, with rules about what kind of data is allowed in and where it is allowed to come from. Finally, everyone’s favorite layer of security…the password. When you login to your computer you should be using a password– no ifs, ands, or buts about it. Almost identical to the computer, your server should be secured under a few layers of security of its own. Antivirus and firewall are a given, as are strong passwords. Servers should also be secured even further by turning off services and uninstalling software and features that are not being used. You can also require that all communications between the server and your computers on the network are encrypted so that if somehow a rogue device found its way onto the network it could not pull information off the network as it traveled between the server and your computer. This is a pretty basic description of the layers of security you should find on most any network today. I hope you can see how the layers of the security onion stack up and that the more layers there are the more difficult it is for an attacker to get to the heart of your network. To quote a cartoon from my child- hood, “Now you know, and knowing is half the battle. CES always gets me excited this time of year. Once I sifted through all the new gadgets and gizmos reported on this year, I found myself not just excited but also a little confused. I was confused because it seems that the consumer electronics industry is confused. Sure there were new TVs with mind- blowing resolutions and great new laptops and tablets, but this is what we have come to expect every year. We expect the technology to get better, so there was no surprise there. What really got me puzzled though was the wearable technology. Displays built into glasses like Google Glass were present and no better looking than last year. Smart watches were HUGE; not in size, but in the buzz they generated. Smart watches connect to your phone and give you access to caller ID, contacts, and social media updates. Instead of pulling out your phone to answer a call or see the latest tweet from your best friend Sally, you check your watch. I am still really not sure about this type of wearable, but there it is and the world seems to love it. Other wearable technology included cloths with sensors that track vitals like a onesie that monitors a baby’s breathing…this one I get. These wearable sensors and electronics can track anything and then log it to an app on a phone or the cloud. This connectivity of devices brings me to the other confusing thing that was big news at CES — connected appliances. This just got silly. First, you might remember me writing a few months ago about something called the Internet of Things. If not, the short version is that smart appliances are coming, and they can be controlled and monitored over the internet. Well these appliances were at CES in force. One device was a toothbrush that monitors your brushing habits and reminds you to brush more often. You could also earn electronic badges as rewards for brushing. If that doesn’t strike you as odd, how about an oven you can text and tweet? No? Check out Mother and her sensor cookies. Place her cookies around the house, and they track movement, temperature, and just about anything else. Then Mother collects the information, learns your habits, and begins to nag you about your life. There were some useful home automation gadgets though. A bevy of network- aware light bulbs that can be controlled from mobile device apps and app controlled door locks particularly stick out in my mind. If you are into games, check out Steam and their SteamOS. Steam allows gamers to stream games to a computer over the cloud like Netflix does with movies. Steam’s big news this year is the Steam Machine Platform. This is a specification that allows you to bring computer gaming “to the living room.” This is really just like an Xbox or PlayStation, but it runs SteamOS and streams your games over the cloud. Steam is just one of the many devices fighting for a spot in your entertainment center. Roku is finding a new home inside your TV, instead of beside it. The streaming media box has partnered with TV makers to run their operating system directly on a TV. I wish that when I go to CES I could take all of you with me, so that you could see all of the cool gadgets. There are more great products and new ides at CES every year than a team of nerds like me could write about in a month. If you want to read lots more about the “stuff” at CES though check out one of my favorite sites http://ces.cnet.com/, because their team of nerds comes pretty close to covering it all. With the bitter cold weather and the water problems the Kanawha Valley has experienced lately, businesses can add a few more items to the list of events, like super storms, that have disrupted regular operations over the past few years. In an age of endless connectivity and mobility though, this disruption does not have to be the case. Using the Cloud can make the days of lost productivity a thing of the past. Not only can your applications and data be in the Cloud, but so can your phones. For most small businesses, a single day of lost work can be a nightmare. In some cases, if a single key person is not able to get to the office the gears of progress grind to a halt. Remote access services like a VPN are a great way to give workers access to company servers. Remote desktop can even bring the entire office desktop environment right to an employee’s home. This is nothing new. We have discussed these technologies before. We have even talked about using services like Microsoft Azure to host backups of virtual machines that run your servers in the cloud in the event the office is completely off line. Remote access is great, but what about communication. Sure your email is working, we moved it to the cloud a long time ago, but what about when people try to call the office and no one is there to answer? The weather man, who is always 100% accurate, has predicted a snow storm that will dump 3′ of snow overnight. Tim your receptionist and Alice your only sales person both live outside town and are likely to get snowed in. Alice is already prepared with her laptop in hand and VPN password in her pocket. However, since her cellphone doesn’t work in the little valley where she lives, how is she going to talk to clients tomorrow and how is Tim going to forward her calls to her? Easy. They take their desk phones with them! 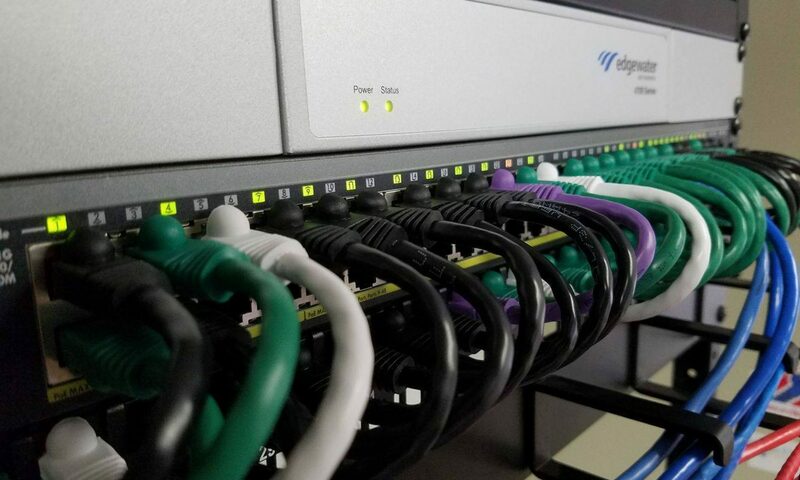 With a hosted VoIP phone system, it really doesn’t matter where the phone is as long as the phone can connect to the Internet. Tim can transfer calls to people at the office or to Alice at her house. Alice can call clients or they can call her on her direct line just like they would if she was in the office, and it is entirely transparent to the people outside your organization.